October 10th is World Mental Health Day. According to the World Health Organisation, ‘if we don’t act urgently, by 2030 depression will be the leading illness globally.’ If you have read any of my posts lately you will know that I have experience, both past and present, with depression. I think it’s extremely important that people talk about mental health. It shouldn’t be something to be ashamed of. You all probably know someone who has/does currently suffer from it. You might yourself, and if you do – don’t feel embarrassed. We need to break the stigma and discrimination. It’s a day first celebrated in 1992 at the initiative of the World Federation for Mental Health, a global mental health organization. The World Health Organisation recognises World Mental Health Day on 10 October every year. Every year has a different theme. This year’s is psychological first aid and the support people can provide to those in distress. What can I do to support it? You can get involved in Tea & Talk – a national fundraising event which takes place today. It’s pretty simple – friends, family or workmates get together, have tea (and possibly also biscuits or cakes), talk about mental health and potentially donate to mental health research charity, Mental Health Foundation. To make a donation, you can text THRIVE to 70300 to give £3 or you can donate online. Generally the day is on October 10 but you can organise one any time and request a pack with some ideas here. Suicide is the most common cause of death for men aged 20-49 years in England and Wales at present. While suicide and self-harm are not mental health problems per se, they are obviously linked to mental distress. Having said that, you shouldn’t assume that because someone has depression, or indeed any mental illness, that they are or have ever been suicidal. Nevertheless, this awful fact shows how much still needs to be done – from improvements in mental health care provision on the NHS through to people having more open conversations about mental health, and beyond. Some other recent stats to think about. 1. Mixed anxiety and depression is the most common mental disorder in Britain. 2. As many as 10 per cent of people in England will experience depression in their lifetime. 3. 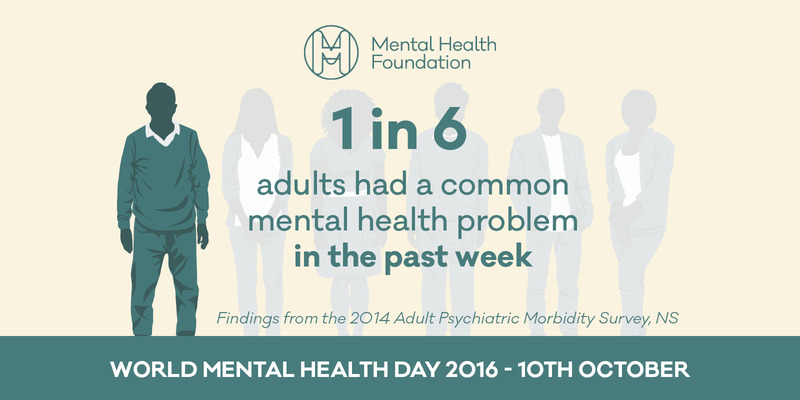 The poorer and more disadvantaged are disproportionately affected by common mental health problems and their adverse consequences. 4. Ten per cent of mothers and six per cent of fathers in the UK have mental health problems at any given time. 5. One in five teens experience a mental health problem in any given year. All statistics from The Mental Health Foundation. While stats can be a starting point for a conversation, I think it’s the conversation – however it begins – that matters. Personally I find it quite difficult to talk about my problems, but I like writing them down. Hence why I like blogging. If you know someone who you think might be suffering, why not write them a letter, text, email, explain you are there for them. Depression can make you feel incredibly lonely, and it can also make you push people away. I know I’ve done that in the past.